What a lovely tribute and message to your younger sister. The photograph is beautiful- both of you look so resplendent. 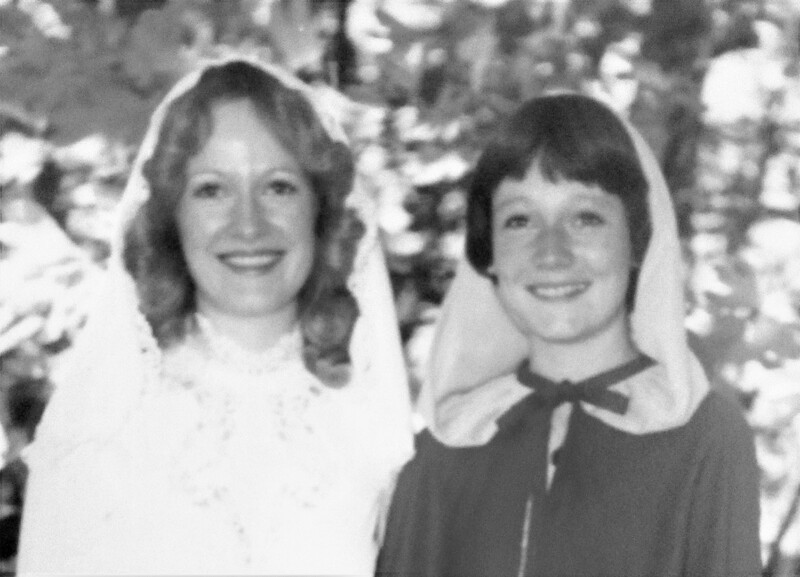 How different a bridesmaids dress from what it is today- very simple and elegant and even the head scarf – beautiful in its simplicity and the humility that it represents. What church was the wedding in ? It was an Autumn wedding so the dress included a cape with a hood. I thought all of the bridesmaids looked beautiful. The church was Olivet Wesleyan Church. It is no longer a church in Glassboro. Attendance became very low and the church was sold to another group who have a bigger congregation. OMG ! This is so sad. And the state of so many of our old churches. But at least it is another Christian denomination that is using it and that is something. I attended a Sunday service at the Philadelphia Methodist church near the William Penn Statue, near the square last year and there were barely a handful of people worshiping in that beautiful church- I was heartbroken. I have never been there. I attend a Methodist Church. The sad things about churches is the same as it is in the world…the message becomes lost in the throng of activities and fund raisers. And as always…people will be people. If I had a problem, unfortunately, there are not too many places I would go to for help…and that includes my church. You are so right- if I had a problem, I would probably share first with God, my husband and now, my blog friends, I guess. Such is the sad pass the world has come to. Yes, it seems as if daily the world deteriorates in values even more. What a beautiful photos and memories, I am sure. You are truly blessed to have a sister and a friend so close by. I truly am blessed…thanks so much. You and your sister both looked radiant and beautiful. Lovely sentimental post. Thanks…We might be a bit more wrinkled and spotty, but God is good to us, and we are still close and close to each other in miles. Cute that she went to put in the kettle/ ha! And is she really a hockey coach? Yes, she coached high school, Rowan University, and also hockey leagues. She was, and is, a terrific player, she played for LaSalle, and her daughter followed in her footsteps and played for Villanova. They are great athletes!